How can anywhere be so consistently and intricately beautiful? How do the all the different blue and orange and yellow and pink houses hang so perfectly on the cliff-side? How do lemons grow to be THAT big? These were some of the questions circulating my head when I visited the Amalfi Coast this summer. From the likes of Diddy, Gweneth Paltrow and Jay & Bey, to Michael Jordan and Mariah Carey, it is the millionaire's Mediterranean playground. But if I can afford it, you certainly can too! The stunning coastline extends from the Port of Salerno to the Gulf of Naples, with the most incredibly charming towns dotted along the way. From the shy little municipality of Furore, to the luxurious town of the famous, Positano, Italy has astonished me again. This could be the prettiest place I've ever been to. 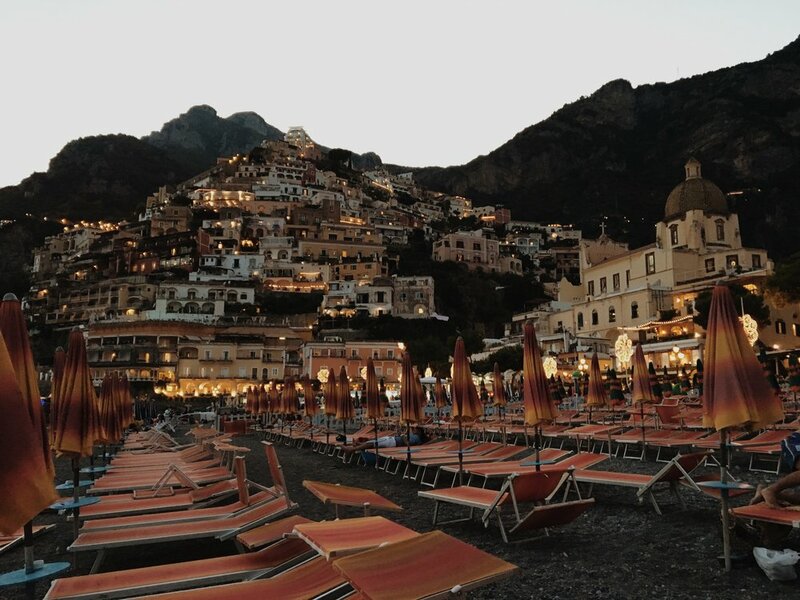 The Amalfi Coast is the holiday playground of the rich and famous, and people often assume that you need a bucket of money to really enjoy it. False. As with anywhere, there are tricks and compromises which can be made to enjoy this luxurious destination. Before I hit you with the jaw-droppers, our beautiful hotel made the trip even more enchanting. I found this fairytale hotel on booking.com, about 4 months before we went in August. Located in the mountains between Salerno and Cava Di'Terreni, it was more than affordable for 3 people for 5 days, as it wasn't in one of the major tourist hotspots (price details at bottom). Surrounded by panoramic mountain views and typically Italian hanging gardens, it was easy to forget that I had a job or any other worldly responsibilities. Stunning right? This is just the hotel. Obviously after seeing this, I couldn't WAIT to explore this Mediterranean paradise. You can catch a ferry from Salerno to Amalfi in 35 minutes, for €8 one way. Amalfi is an old port town, and is the smallest of the three I visited. 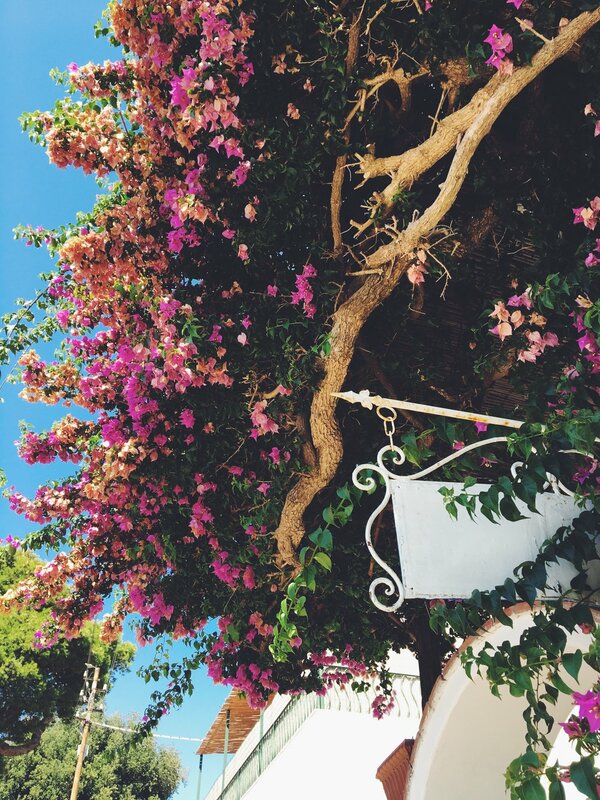 Its small beach and tiny lanes are enchanting, the streets are scented by the lemons growing on the surrounding terraced cliffs. By sea is the best way to get to the main towns, as you can see the astonishing landscape-the cliffs that drop into the sea and the houses that sit on the edges of them. When you arrive in Piazza Duomo, you are greeted by the sweet and subtle scent of lemons. Then, after walking around for approximately 7 seconds, you will see that lemon products are the ONLY thing vendors are selling! You simply cannot come to Amalfi and not find out more about why this region is steeped in the ochre citrus fruit. Every morning at 10.30am, the yellow buggy will be waiting at the bottom of the steps of the Cathedral, to take you up to the lemon terraces. We did the short tour which lasted about 1.5 hours, for £20. which is a good price for the region, see the website for more options. When you get there, you are met by Salvatore Aceto, son of Luigi (could you get more Italian names?! ), whose family have own these lemon terraces for centuries. You also get stunning views of the surrounding scenery. ....and at the end they leave you with their produce! A glass of the most lemony lemonade, moist, melt-in-the-mouth lemon cake, and different types of tangy limoncello to kick start your day. Capri is a true Mediterranean island, and has been inhabited for thousands of years, namely by the Emporer Augustus. Capri shares its name with the main town and is where you find yourself landing as you come off the boat. Then you'll stop for a swim...or maybe a photoshoot. Eat off the beaten track at L'Angelo del Gusto - you won't be disappointed! Pictures don't really do Capri any justice, it really is a dream destination. Head up to Le Sirenese Hotel for stunning views of the town. Whilst it is a luxury hotel, you can freely walk in and take in the view on their balcony overlooking the iconic mosaic dome. After calling repeatedly, we secured front row seats to eat and watch fireworks at Covo Dei Saraceni,a five star luxury hotel that offers a selection of traditional cuisine, as a very reasonable price. So, there you have one of the most stunning parts of the world. I do plan one day to have a holiday home here!